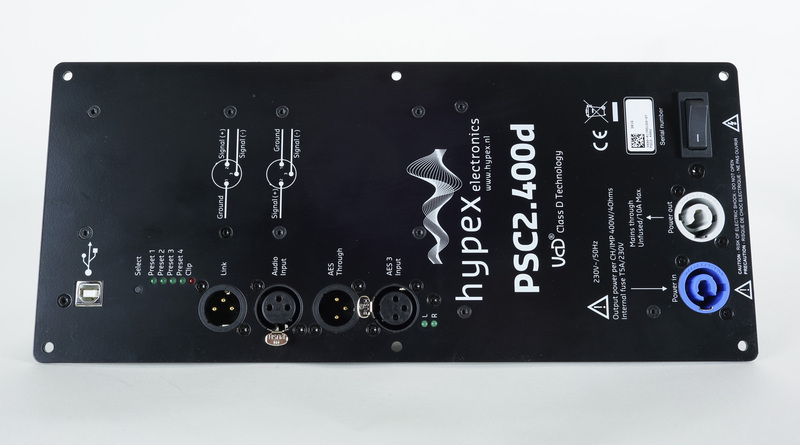 Here a short presentation of how to use the Hypex PSC2-400(d) modules should you want to make changes to the files made for ATS4-HE and MUN-17 speaker constructions. There will be more in future, because these modules are just simply great! Writing a short manual for the use of software is trouble. Whenever I dig into new software from a manual, there are always things the writer assumes logical or self evident. There isn't! 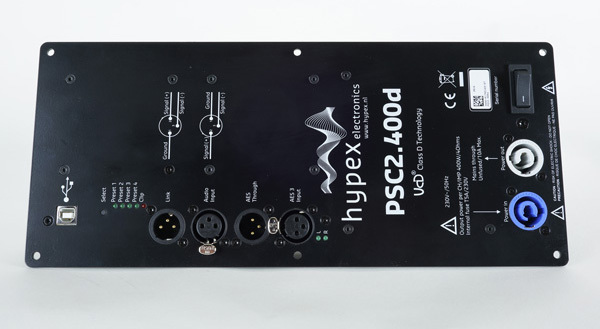 Using the PSC2.400 module is easy - once you've done it a few times - and let's go through some of the few things you need to do to make your own programming. The Hypex modules can do thousand things not mentioned here (check manual), but making a simple low-pass filter for a bass driver is really what most of us need. Un-zip the file and you have the folder seen above. Download Filter Design manual here. The software automatically makes a folder in Documents with "FilterData". Here all your files will be stored. 1. Turn on your Hypex module, but do not connect to your computer. 2. Click on your desktop Hypex Filter Design icon and you see the above. 3. Connect your Hypex module via an USB cable and the "Device setting" is turned on. 4. Click on "Filter design" and you will see the blank sheet below. 5. Click File and "New PSC2.400" and you get the image below. 6. The following is an example of how to make the program for the ATS4-HE 12" bass driver. Click on Channel2/low! Also click Preset 1! The Hypex can hold 4 different programs for the two amplifier modules, e.g. you can replicate the channel-1 and -2 programs in Preset 2, 3, and 4 and you can switch between the four programs by pushing a small button on the Hypex panel (green LEDs). This can be done during playing. What can be done here is replicating the programs with various bass levels, e.g. gain setting at 11, 12, 13 and 14 dB to suit room conditions. Right-click on sheet and you get an "Add filter" and click on Add filter icon. 7. 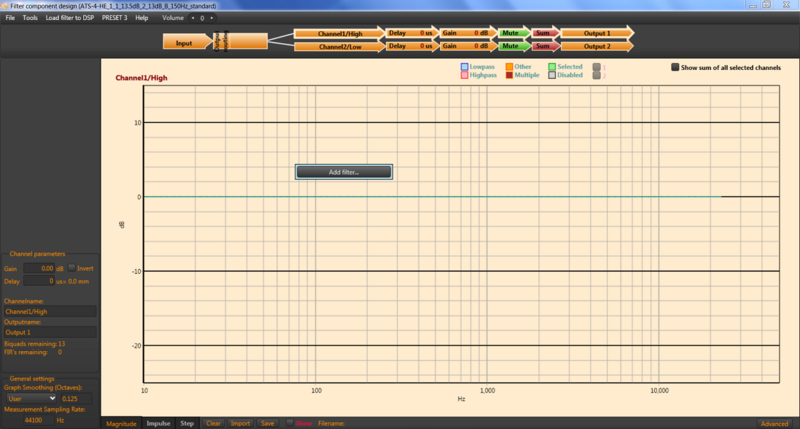 In upper left corner "Set filter parameters" appears. 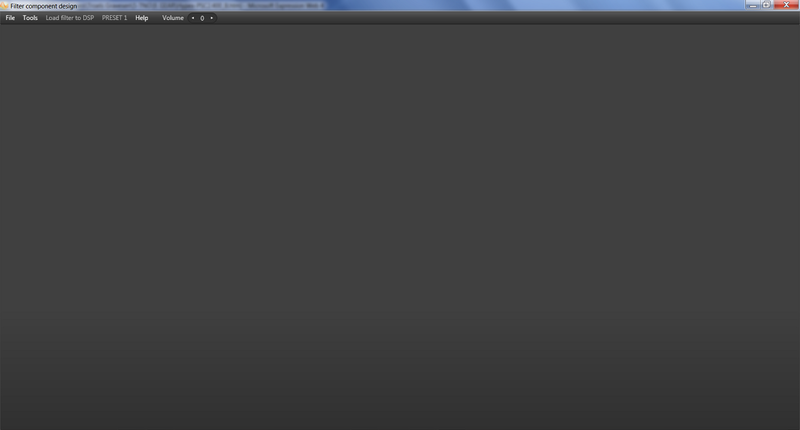 Click "LowPass2" (this is a 2nd order filter) and you see the below image on the screen. 8. Pay notice "Volume" (upper line) is now set to "0" and "Channel parameters" is set to 13.5. This means the total gain is now 16 (basic gain) + 13.5 = 29.5 dB. Then click on graph and you see the below profile, 2nd order low-pass filter at 80 Hz and lifted 13.5 dB and volume = 0. Right-click on the green dot and you find the toolbox to the left. Set center frequency to 40 Hz and gain to 4 dB. Click on graph (not the dot) and you will see the resulting profile as below. 10. It can be recommended inserting a sub-filter if you dig vinyls or just want to protect your speaker driver. Right-click again on sheet and add filter. 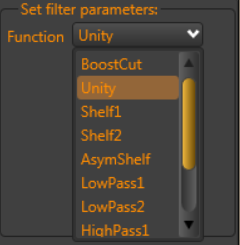 Insert HighPass2 filter as seen on tool-box. Last thing to do is up-load the program to the Hypex module. 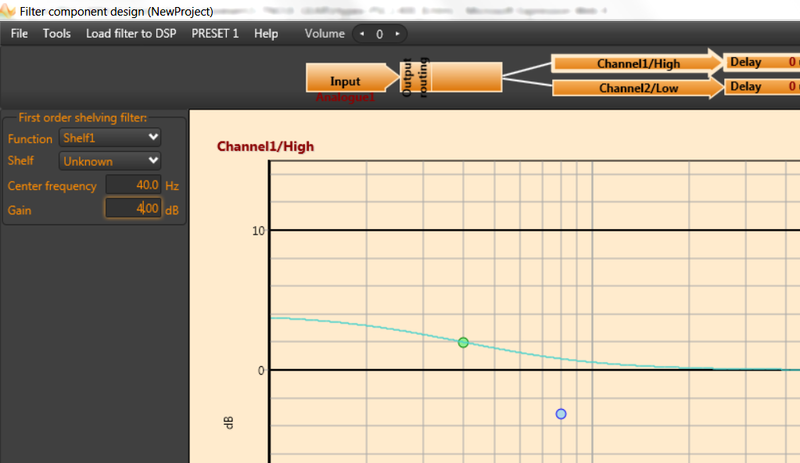 Up-load either current preset or all presets depending on where you are in your programming. Choose channel 1 and insert 2nd order low-pass filter at 150 Hz. Gain is set to 13.5 dB. 150 Hz is chose here to make proper integration with the middriver @ 200 Hz. We can't always count on the driver response to be linear. What will be presented here are two options where you need a line stage, preferably with double balanced output and some min. 10 dB gain. My own line stage has some 14 dB gain and fits the Hypex modules perfectly. If you don't have double balanced output, you need to make a pair of short cables where you split the signal into two lines. Obviously you can make this from single ended output, but you loose some gain and preferably need a pre-amp with 20 dB gain, which is common. If you only have a single pair of single ended output, use a phono splitter + adaptors. 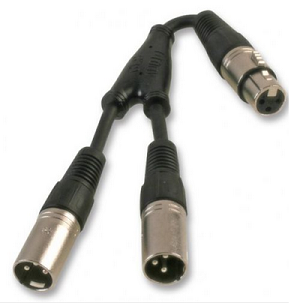 If you make your own cables, short pin 1 and 3 in the XLR plug (ground). If your pre-amp only has a single pair of XLR outputs, you need a splitter like this. They're 5.80£ on eBay. Cheap. First option is having a line stage running one of the Hypex amps and your preferred power amp running the MT section. 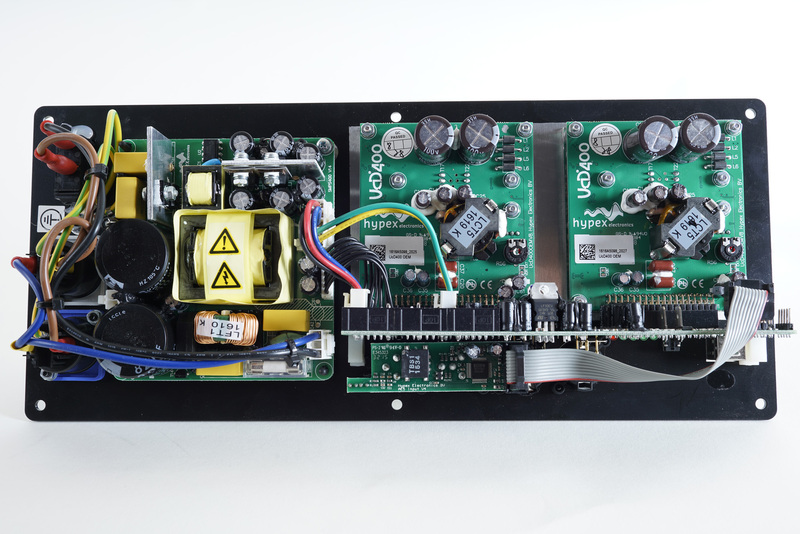 What you need to know is the gain of your power amp. The program provided is tuned for a power amp having 26 dB gain. 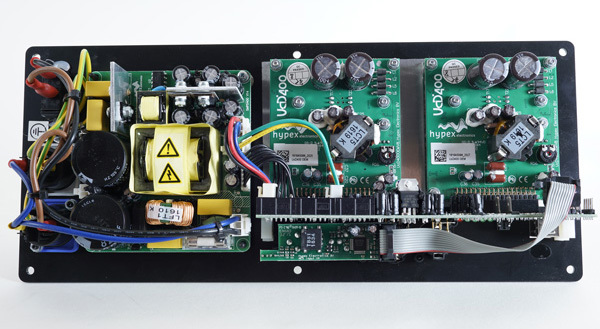 If your power amp has 23 dB gain, you reduce the gain of channel 2 from 13 dB gain to 10 dB gain, thus aligning the Hypex module with your power amp. The Hypex comes with a default 16 dB gain, thus programming channel 2 to +13 dB makes and overall 29 dB gain. 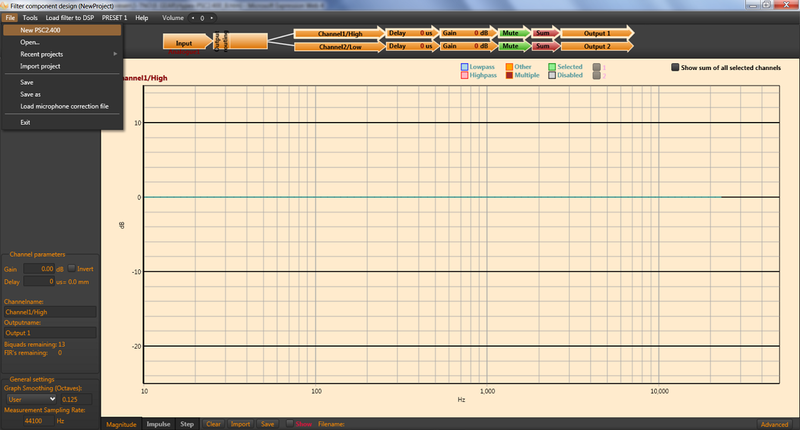 This fits the MT section running from a 26 dB gain power amp. The Hypex also has to overcome the baffle step loss of the 28W driver. 88 dB sensitivity (MUN-17 construction) on an infinite baffle is nice, but not possible from a small 34 cm wide box. Second option is having your line stage running the Hypex and use both Hypex amps, one for the bass and one for the MT section. In both cases we need a passive crossover for the MT section. I'd say the sound of the Hypex would satisfy the majority of people. The long and the short of it is that you need to know the gain of your power amplifier to balance the sound of bass and MT section. What you get in return is the ability to tune your speaker to your room conditions in a way no other speaker on these pages can do. You can even tune bass differently if you have an asymmetrical setup with e.g. one speaker in a corner. Unfortunately a much too frequent situation.